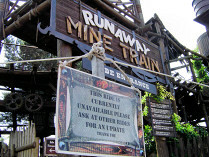 The Runaway Mine Train may get a makeover before it reopens in 2007. It's been rumoured that the ride, which has been closed for the past few months following a crash which injured several people, will be upgraded during the coming closed season. Possible changes might involve speakers on the train itself, as seen on Rock N' Rollercoaster at Disney Studios in Paris. At this stage these are just rumours, so it may not happen - but if they go ahead it will be interesting to see how well the modified theme fits in with the existing one. Take some waterproof clothes; the golden showers can be diabolical.